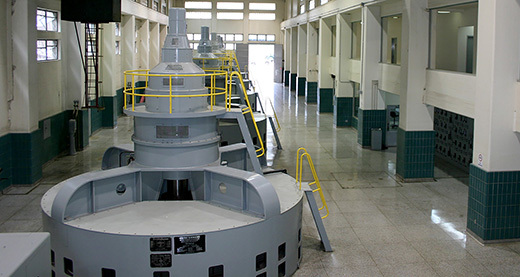 Historic hydroelectricity… Since they began operations in 1940, the hydroelectric units inside the Pensacola Dam powerhouse have played an important role in GRDA’s overall generation portfolio. Meanwhile, there are some other benefits of hydroelectricity that go hand-in-hand with power production. Since its beginning in 1935, the Grand River Dam Authority has been in the hydroelectricity business. After all, Pensacola Dam – Oklahoma’s first hydroelectric facility — was built to harness the waters of the Grand River, and the river has produced a lot of megawatts of electricity for the state of Oklahoma in 70-plus years. Of course, Pensacola is just one part of GRDA’s hydroelectric history. The Authority also built Robert S. Kerr Dam in the early 1960s and the Salina Pumped Storage Project (SPSP) in the late 1960s/early 1970s. All together, these resources play a role in meeting the electrical demand of thousands of Oklahomans all across the state, and it’s all done with clean, renewable hydroelectric power. According to the United States Geological Survey (USGS) hydroelectric facilities, like GRDA’s, “fit the concept of renewable energy” because these facilities use “running water, without reducing its quantity, to produce electricity.” At GRDA, that water is used repeatedly as it flows down the Grand River, through Pensacola Dam and Kerr Dam, and also as it is pumped up and stored at the SPSP. Hydroelectricity increases the stability and reliability of electricity systems because hydroelectric generator units, like those inside GRDA dams, can be started very quickly. At GRDA, this quick start capability can then be mixed with other portions of our diverse generation portfolio — coal, gas and wind resources — to quickly meet demand, keep rates low and reliability high. Hydroelectricity contributes to the storage of drinking water. Did you know that GRDA lakes serve as storage for 50 Oklahoma municipal water systems and rural water districts, including Tulsa? Without the presence of hydroelectric plants, that storage might not be available. Hydroelectric power helps develop the entire region. Prior to Pensacola Dam, the surrounding region was rugged and rural. Today, that region is the heart of a large and thriving tourism and recreation industry that relies on GRDA lakes as well as the low-cost, reliable electricity produced by GRDA. There are other hydro benefits but these are just a few of the reasons why the GRDA story, which began with Pensacola’s completion back in 1940, continues to be an important story for all of Oklahoma.